The automatic hydraulic courtesy step and full-height door provide easy and comfortable access to the individual luxury seats fitted with full diagonal seat belts. Even if you are relaxing in the back you can enjoy front-seat views by watching our on-board Road-Cam video system, as well as uninterrupted side views from the large picture windows. 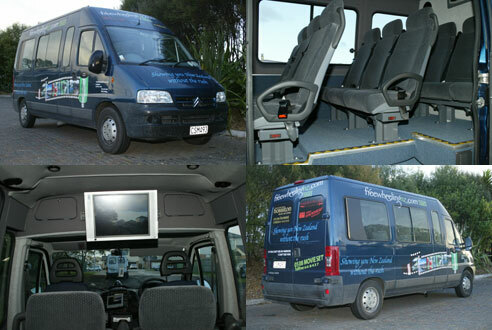 An informative commentary by our professional drivers and promotional videos of destination information complete the superb FreeWheelingNZ.com Tours experience. So hop on board with us and let us drive you through our safer world.